Our 2,800 sq foot kitchen is available to rent by the hour. You can rent just the hours you need for your volume of production. 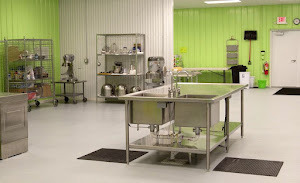 We supply the kitchen facility, utensils, basic kitchen equipment, basic pots and pans, a ware washing isle, hand sink, mop sink, kitchen towels and supplies for clean up. Dry storage, freezer and cooler storage and rolling lockers for your supplies are also available for rent. We're here to help you grow your food business!